An engraver, a cartoonist and a muralist. Maverick, Pease and Mortellito. Peter Maverick, one of American’s leading engravers, spent a good portion of his professional life in Newark. He was born just outside of New York City on October 22, 1780, when the British were occupying the city, and died in New York on June 7, 1831. His grandfather, Andrew, was a Boston painter who had emigrated to the colonies in 1728. His father, Peter Rhusten Maverick, was a copper plate engraver and silversmith of some importance. During his professional career Maverick not only established himself as a fine engraver, he also was a copper plate printer. Eventually, he added lithographic printing to his accomplishments. Maverick went into business in New York in 1801. Apparently, he worked there and in Newark. His name, as well as Newark’s, appears on multitudes of banknotes, maps, magazine illustrations, diplomas, certificates, legal forms, business cards and business records of all kinds. Like many people who rise to the top of their profession or craft, Maverick was intent upon being the very best in his field. He took great pride in the fact that he was regarded as 'the best engraver on this side of the Atlantic,' thus his services came at a considerable cost. 'I cannot be obtained for less,' he often said. Maverick’s banknotes were issued by institutions in Newark, Camden, Elizabeth, Trenton and Elizabeth as well as in Jersey City, Perth Amboy and Morris and Sussex counties. They also were used by banks in Rhode Island, Georgia and Missouri and he was well-known in South America too. Examples of Maverick’s work are found in the Metropolitan Museum of Art in New York. They include a book plate from Newark’s Female Bible and Common Prayer Book Society, a business card of Andrew Rankin, identifying him as a 'hatmaker opposite the State Bank in Newark, N.J.,' a design for a silk hat lining for William Rankin and a city map that listed his home as being in the Woodside section of North Newark at the later site of Mt. Pleasant Cemetery. The Newark portion of Maverick’s career took place from 1809-20. Before coming to the city, he married Mary Griffin of New Providence on May 15, 1802, and set up his home and business at 62 Beekman St. in Manhattan. In 1809, Maverick brought his family here and settled at Harvey Street. In 1812, he built a new home, 'The Cottage,' near Lincoln and Chester avenues, where he and Mary lived with their eight children on a 20-acre farm. He created most of his best work there. Maverick was closely associated with Trinity (now Trinity and St. Philip’s) Cathedral. One of his children, Octavia, who died in infancy, was buried there on the site of the present diocesan house. Starting in 1812, Maverick was associated with Asher B. Durand, who served as his apprentice and eventually became a business partner. This lasted until 1820, when Maverick returned to New York, settling at 2 Pine St. in lower Manhattan. According to several contemporary sources, Maverick may have conducted business in New York and Newark at the same time. In 1822, one of his most important projects came about when he compiled for Thomas Jefferson the engravings for the former president’s plans for the University of Virginia. In 1826, Maverick was elected to the American Academy of Fine Arts and helped found the National Academy of Design. Although he was busy and much in demand for his the rest of his life, he still took time to perfect a rotary engraving lathe, which came into popular use. There is a portrait of him by John Neagle. Maverick died on June 7, 1831. He was buried in St. John’s Cemetery in New York City. His son, Peter, carried on the work of his famous father in Manhattan until 1845 and is listed in New York directories of the period as an engraver. For many years, little was remembered about this important Newarker. That was until Dr. William S. Disbrow began collecting information about his work and assembled examples of his art. Dr. Stephen De Witt Stephens, director of humanities at the University of Newark (now Rutgers-Newark) started searching primary sources in order to list Maverick’s contributions to American printing. In 1954, more than 100 Peter Maverick engravings were given to the Newark Public Library by Stephens, adding to an existing group of Maverick materials on file and 'making that institution one of the most representative collections of the master engraver’s works,' according to the Newark News. Today, these materials are in the special collections of the library. Upon occasion, they are exhibited in Newark and in printing exhibitions around the country. Lute Pease, Pulitzer Prize-winning cartoonist for the old Newark News, was born in a mining town in the west. After being orphaned, he grew up in Vermont, where he became editor of a prestigious literary publication. Eventually, he settled in Newark, where he spent the last half-century of his life. Pease’s real name was Lucious Curtis Pease. He was born March 27, 1869, in Winnemucca, Nev. When he was 5, both his parents died, first his father, followed five months later by his mother. Pease was sent to Charlotte, Vt., to be raised by his grandfather. At 18, he graduated from Franklin Academy in Malone, N.Y., and went west to make his fortune. He tried to save $5,000 to study art in Paris, but never was able to do so because money was tight. Pease held down a series of jobs, including running a small bicycle shop in Oregon. In Portland, he witnessed a suicide and murder, which he sketched and submitted to the Oregonian newspaper. He was paid $10 for it. He became a reporter and artist and for a while worked for the Oregonian, excited by the variety of assignments he was given to cover. In reporting, he said he often 'clothed the interviewees’ words in the best words I can use, throwing in a few of his pet phrases to make him and others think it was exactly what he (the person) said.' One of the highlights of his news career came when he met Mark Twain. The next phase of Pease’s life occurred in Alaska, where he was lured by the Klondike gold rush. Filled in his youth with a certain recklessness, he withstood the harsh winters and dangerous surroundings in his quest to make his fortune. From 1897-1902 he traveled the icy trails of Alaska, searching for gold and gathering experiences that would last a lifetime. They were particularly useful to him as a writer and cartoonist. In Alaska, he was made the first U.S. commissioner for the Kotzebue Sound-Point Hope District, opened a bunkhouse hotel for miners, the Hotel del Norte, and began to experiment with the domestication of reindeer. In 1902, he decided to return to the Oregonian, where he met his future wife, Nell Christmas McMullin. Three years later they were married. In 1905, he began his literary career on the Pacific Monthly. Eventually, he became an assistant editor, and later an associate editor. Largely through his influence, the periodical’s circulation grew from 40,000 to more than 100,000, making it one of the most important literary magazines in the Northwest. At this time, Pease also became friends with Jack London and published London’s serialized novel, 'Martin Eden,' which had been turned down by several East Coast publishers. London was said to be 'paralyzed with surprise when he received a check for $7,000' for publication rights. Eventually, the Pacific Monthly’s circulation reached 500,000. By that time, Pease’s salary had climbed to $10,000 annually. But trouble lurked. Attempts to muzzle the liberal spirit of the magazine and increasing publication costs led to its decline and eventual demise. An era had definitely ended. Lute and Nell Pease then came East because of her father’s deteriorating health, prompting Pease to take a breather from his strenuous life. For him, 1913 was a year of loafing, filled with many freelance jobs. Nevertheless, it was an important year, because it marked the start of his cartoon syndicate. Because of it, John W. Maynard, onetime editor of the Newark News, became acquainted with his work. In 1914, Pease accepted a position as political cartoonist with the News and settled in Maplewood at 105 Durand Road. This was the final settling place for him and his wife. When asked why he chose Newark and the News, he noted, 'It is the only paper I have seen that fills my notion of an honest, independent newspaper with high ideals.' His opinion of the industrial East in general, however, was not as flattering: 'Drat the climate and these mangy, squalid Eastern manufacturing towns! Twenty-five hundred here and the foreign factory class prone to tuberculosis. The West forever, say I and back I go when I can.' Yet on another occasion, he described himself as 'an old-time Newarker' and talked of the growing city like a native son. Still, there were times after he came to Newark when he wistfully recalled the adventures of his youth as a miner, cowpuncher, lumberman, hotel proprietor and frontier federal official. Pease did not return to the West, except for occasional visits. Domenico Mortellito, the muralist and third of our three artists, was born in Newark in 1907. He graduated from East Side High School, the old Fawcett Art School, the Newark School of Fine and Industrial Arts and the Pratt Institute in Brooklyn. Mortellito’s father was a grocer. The family lived at 150 Green St. As a boy, he swam in the old Morris Canal when it was an open invitation to skinny dipping. One of his famous Newark Subway murals is of this very subject. Working for his father in the grocery store at the edge of the canal, Mortellito got to know the city by feel, touch and smell. The marginal and poor people of an industrial city were etched into his mind and memory and became part of the many images of Newark that were translated into his work. In 1990, Andrew Constable, an art student, wrote a paper, 'Domenico, Diego and the WPA,' in which he made a connection between Mortellito and the great Mexican muralist Diego Rivera and their feeling for the common man and the realities of the world of hard work. On his wagon his father took to market, Mortellito saw the city at sunrise and sketched it in crayon. 'In all my stuff,' he said in 1932, 'I try to approach a subject, old or new, from a single angle. I have studied the old and historical art for background, but today is today. I must draw as I live. Tomorrow, I may have a new idea and a new concept of life entirely and my pictures will change.' In addition to traditional work in crayon and oils, Mortellito experimented in with plastics and Teflon, quite unusual for the time. A list of his art in public places and among private concerns is impressive. At Yale University’s Woolsey Hall, he completed a series of murals. He painted the decorative polychrome ceiling and frieze at the J.P. Morgan Library in New York City and created bands and borders in the courtroom and in the corridors at the Essex County Courthouse in Newark. 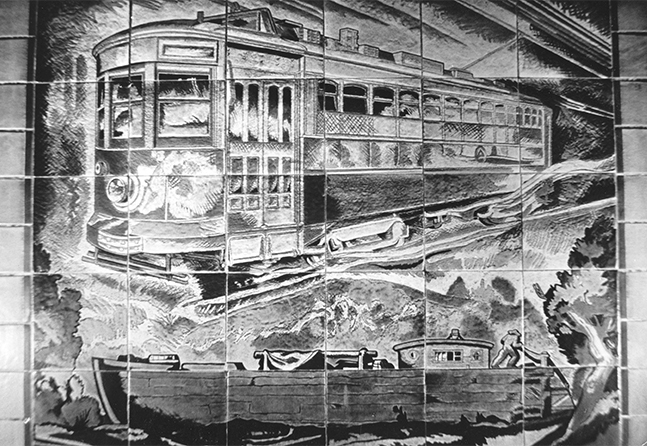 Mortellito also was called upon to create murals in the lobby of the Newark School of Fine and Industrial Arts. His work consisted of four wall sections. The two above the entrance represent instruction and administration of the art school. The other two depict classroom activities, including the arts and crafts, architecture, costuming and dramatics and the use of art in industry, namely mural painting and sculpture.